After years of requests from the competition circuit, we have designed the Cimarron trailer to fit those needs. The Cimarron is sleek, lightweight and competition ready! We started with our Cimarron model competition cart and extended it another foot, giving you a 26" x 66" chamber that boasts 2,400 square inches of cooking space between the two grate levels. 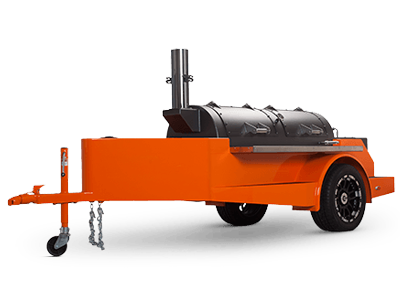 This pit can cook an entire competition, with room to spare, and with Yoder Smokers' legendary Heat Management System, the heat and smoke in the Cimarron Trailer can be precisely and effortlessly controlled.